Miss Diamond will be co-ordinating the School Council after Christmas. The theme this year was Superheroes, so we decided that children could come to school on the day dressed either in Pudsey or Superhero themed clothing, if they donated £1 to Children in Need. The School Council also decorated 300 Pudsey biscuits to sell after school on the day. We raised £550 - well done everyone, especially Libby who raised £70 by doing a fun run. She is our superhero! We are now looking at doing something for the Manchester Dogs' Home. Our theme this year is "citizenship"
LATEST NEWS JULY 2014 - We have chosen. The school council held an assembly about the options for the 5th zone and the children voted overwhelmingly for a play pod! Mrs Angus is now talking to the suppliers to see how much it will cost and when it can be delivered. The members of the School Council researched what could be the 5th zone on the playground. The choice was narrowed down to either a Trim Trail or a Playpod. 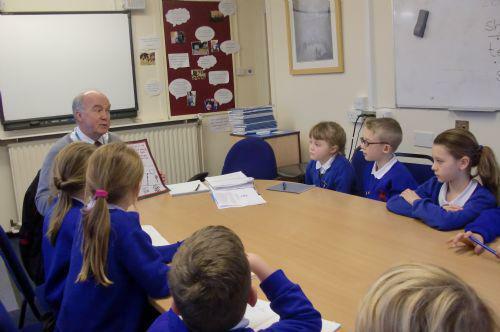 The School Council visited Mills Hill Primary School in February as they have both. They met with their School Council to ask questions and went outside to see the Playpod in action. They are now preparing to present their findings to the pupils so a decision can be made. 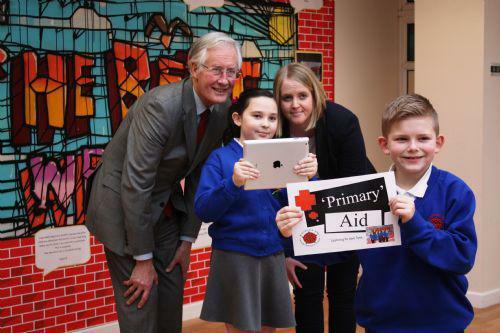 On February 7th we had a visit from Mr Michael Meacher, MP and Councillor Amanda Chadderton, OMBC cabinet member for education. 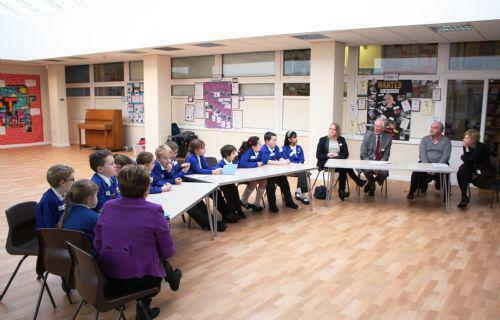 They met with the School Council and viewed the film entry for the Lights Camera Parliament competition. We have made a film entry for this competition - our suggested law is that all children from the age of 7 should learn First Aid at school. Councillor Shuttleworth attended our meeting on 12th December. 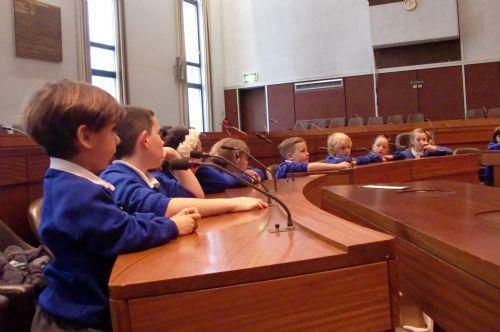 On Monday 21st October, the School Council visited the Civic Centre in Oldham and met with former Mayor, Councillor Battye. 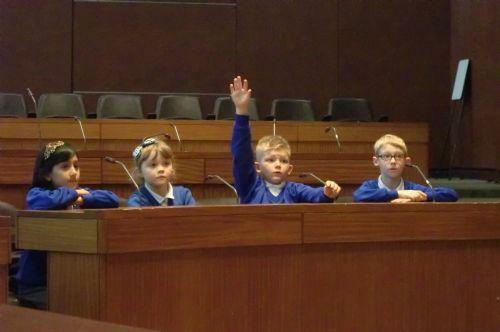 "It was a great trip to the Civic Centre and we all enjoyed it", Teddy, Year 3. We sat in the Council Chamber. 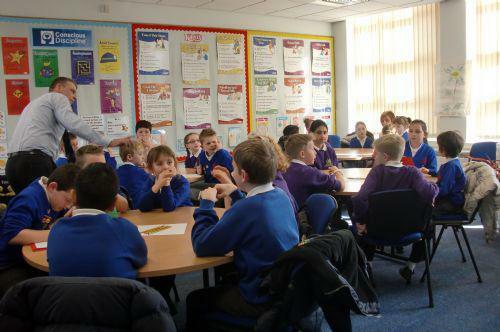 We asked lots of questions and found out a lot about Oldham and the Council. We were shown all the silverware in the cabinets. Beth thought it was beautiful. 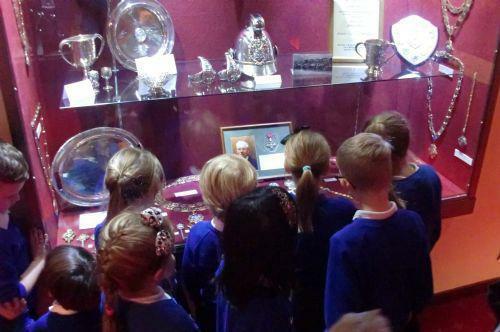 We had some refreshments in the Mayor's Parlour and we were shown the chains that the Mayor and Mayoress wear. "Being a Mayor might be a job I would like to have when I'm older", Jacob, Year 6. 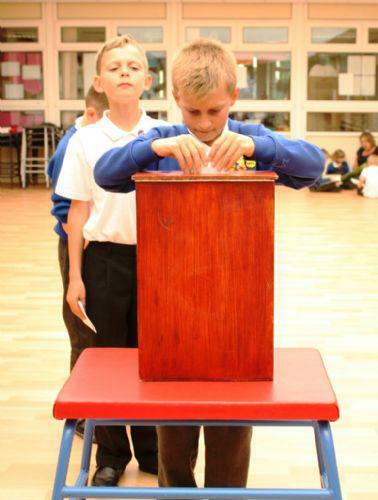 During the week 9th-13th September, the school took part in an election week for the School Council. 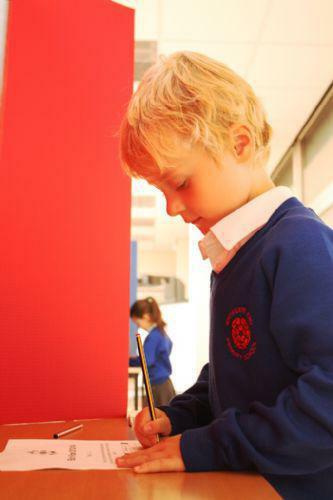 Candidates from each class were given an opportunity to canvas for votes and on Thursday the Atrium became a Polling Station. 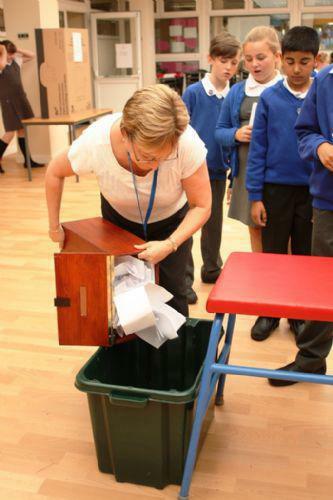 Each pupil from years 1-6 entered the polling booths to vote and placed their completed ballot paper in the Ballot Box. 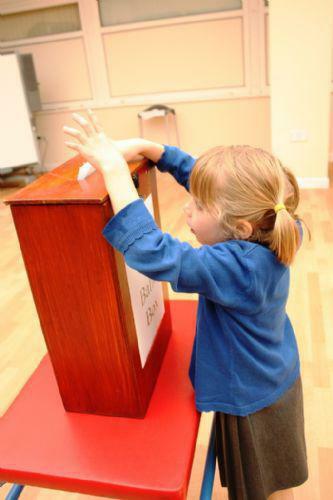 The votes have been counted and the School Councillors for 2013/14 are Jem and Beth (Y1), Dylan and Maya (Y2), Teddy & Leah (Y3), Mason and Zahra (Y4), Joseph & Daisy (Y5), Jacob & Emily (Y6). 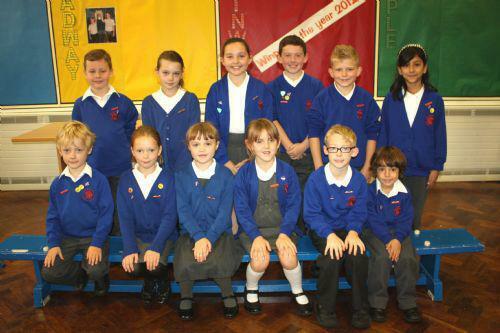 The School Council, supported by Mrs Angus, are part of the Pupil Voice at Whitegate End. 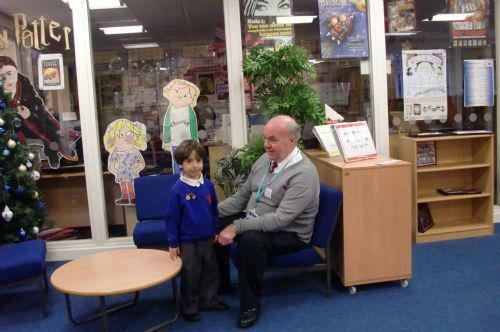 They play an important part in the life of the school, seeking and representing the views of all the children. JULY 2013 - Changes to Lunchtimes! As a result of the research we did during 2012/13, lunchtimes at Whitetgate End will be very different from next year. We will all have the same lunch break, 12-1, and will be able to access any of the playground zones; Sport, Quiet Area (in the new seating under the top gazebo), Games and Games Tables (under the lower gazebo). The areas under the gazebos will have new flooring so we can use them even in wet weather. Also, staff from Oldham Sports Development will be organising sport activities during three lunchtimes. 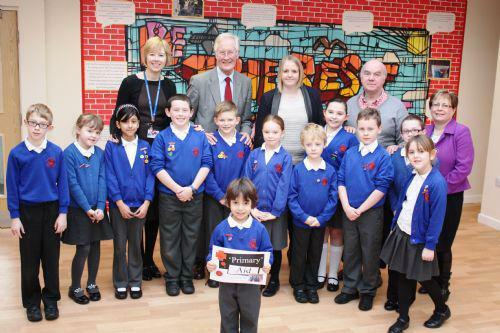 We have been involved in a project to develop our playgrounds and outdoor space. We asked the children what they would like to have on the playground. We got a plan and price for a new Trim Trail but decided we needed to do some research before we went ahead. We went back to talk to the children in more detail and identified three main areas - sport, games and a quiet area to sit. We then visited other schools to see what they had and research trim trails and their use. We presented our findings to Miss Ashton. 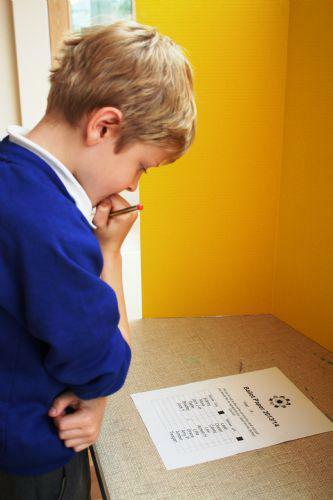 Whilst we were awaiting a decision on the bigger items, we ordered some smaller games for use at break and lunchtimes. Whitegate End Could Be Even Better If? The School Council members visited classes to find answers to these questions. The feedback to the first question was wonderful and the School Council made a speech bubble to go on their notice board, containing lots of positive messages.There were lots of ideas to make Whitegate End even better (although one pupil did say it couldn't be any better!). One frequently raised area was improving the outdoor space. The School Council are now following this up in more detail so we can make plans for the development of our playgrounds and outdoor equipment. To support the funding of any development, the School Council have launched an Enterprise Project for the Spring Term. 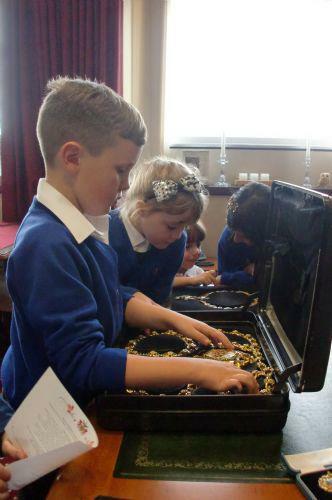 Each class (Y1-6) were given £25 and they were tasked with using this to make money. 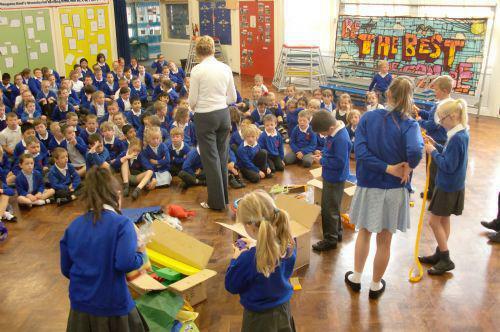 The class winners were Year 1 who made toys and organised a new and used toy sale. 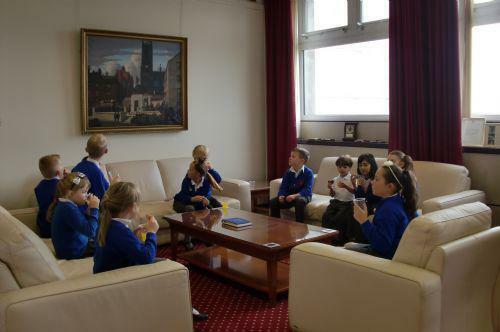 The children visited the mayors office & parlour. They then looked at his dining room and artwork. 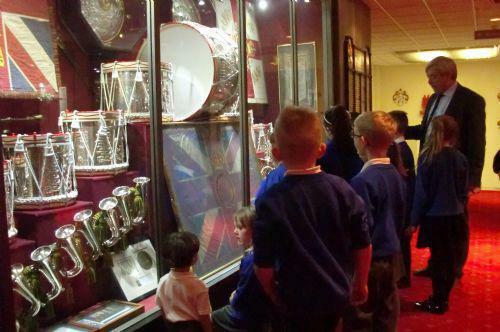 After that they looked at all Oldham's silverware and finally sat in the council chambers. Thomas pretended to be the Mayor, Kade was the deputy Mayor and Emily pretended to be the chief excutive. We had such an interesting time!